Last December, I wrote an article on the importance of buying local for my city's green newsletter. I played up the importance of supporting neighbors in a bad economy, the fact that local businesses give 350% more support to non-profits than do non locally owned businesses, and the value of preserving local culture. Within hours of sending out the newsletter, a very active and very green citizen shot me a blistering email. She found my article divisive and offensive. What was more, she hated our downtown. It was too expensive and didn't carry some of the items that her 17 year old niece wanted for Christmas. She scoffed at donations made by local businesses to our schools and community organizations. They couldn't possibly compare, in size, to the 5% that Targets allegedly give back to their communities. And she wanted a Target in our town, darn it! A green one, that she could walk to. Never mind that there is a Target the next town over. She needed one here. I put together a lengthy and, I hoped, eloquent response, declaring my allegiance to Main Street. The other green task force members piped in with positive thoughts about buying within the city limits but it was the response from the task force's fearless leader that made the biggest impression. "Mary, have you read Big Box Swindle? Let me send a you a copy so that you can better understand the importance of supporting locally owned businesses and the impact of big box stores." Here I sat, a green bookworm if ever there was one. Heck, I even blog at a place devoted entirely to green reads and yet I'd never heard of this book much less read it. 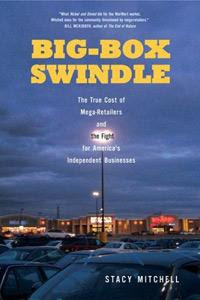 I immediately logged into my library's online reservation and reserved a copy of Big Box Swindle: The True Cost of Mega-Retailers and the Fight to Save America's Independent Businesses by Stacy Mitchell. Before reading it, I had intuitively known that local businesses provide more interest, more diversity in the marketplace and I had supported other bloggers who felt the same. I had read, with great interest, the chapter in Affluenza that pointed out how chain businesses erode our communities and ship our dollars to corporate headquarters instead of to city hall. I had nodded in agreement with Bill McKibben when he explained, in Deep Economy, that, when chain stores come to town, the individual benefits (through cheaper socks and shampoo) but the community suffers. 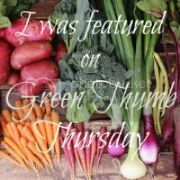 Indeed, I had immediately agreed with Katrina, from Kale for Sale, when she suggested that, at The Blogging Bookworm, the book list link to independent bookstores instead of Amazon. And the first ad we ever put up at The Green Phone Booth was for IndieBound, an online cooperative of independent bookstores across the country. But knowing, or suspecting, that it is better to support local businesses is one thing. Having the marketplace laid bare, with all its secrets and swindles set forth, is another. For me, Big Box Swindle is the next The Omnivore's Dilemma. It rocked my world and opened eyes in a way no other book has since I plodded along with Michael Pollan through factory farm feedlots and the fields of PolyFace Farm. In Big Box Swindle, the author systematically explains how chain stores have changed American culture. They've moved us out of our downtowns, into our cars, and out to the fringes where we buy things shipped from Asia, made with toxic ingredients by people paid unethical wages, and rung up by a cashier who works full time but lives below the poverty line. They've ripped up our forests, torn down our historic buildings, and polluted our rivers and streams as they pave over more and more of the country. They've limited our selection. We wear the clothes, dance to the music, and read the books that an ever-shrinking group of people choose for us. "The pressure [the mega retailers] place on manufacturers to lower costs has sharply curtailed investment in product research and development." (138). They've taken subsidies from well meaning but ill informed city councils and demanded tax breaks in return as they bring in lower paying jobs and drive local businesses out of business. They've stripped our country of its meeting places, whittled away at the idea of community and left us paying the same price for shampoo as we did before - but with a smaller paycheck, fewer community amenities and for a lesser product. If you care about rebuilding your community, about rebounding from this economic collapse, about preserving those beautiful natural spaces and those binding community places, if you want to have more choice in what you use to wash hair or paint your walls, if your city is struggling to pay it teachers or keep its park and rec classes open, this book is for you. It is impossible to move forward without truth. And of truth, this book offers plenty. But it also offers solutions. Ways to overcome the big box syndrome sweeping the country. Ways to fight it within your own community. And ways to support those independently owned businesses the provide our country with the beauty, the diversity, the flavor the heart that makes up America. The politicians have bickered enough about bailouts and stimulus packages. This book provides the blue print for the only one that matters but the only folks who can do it. Together, we can bail out Main Street and get back the community we all want. Rating: 10 out of 5. Recommended: For everyone who has ever paid for anything. You have just made my day!! I have been searching for something like this. Something to explain what has happened to our world and hopefully what we can do about it. Thank you, thank you, thank you. I will check it out and write up a reference to this on my blog. Just added it to my library list! Great recommendation - I'll have to check that book out. There is one big box store that I particularly loathe. People always defend it to me by saying, "they have the best prices on this and that." What people don't realize (and I know because I used to sell raw materials to some smaller manufacturers in past life) is that some big box stores not only beat up small businesses on price, but they do it by bullying the small manufacturers. If you sign a contract with them, what leg to you have to stand on if they back out and leave you with all your manufactured goods? Fighting the legal battle would put you under. Our company sells quality, responsible products intentionally. They will last a long time, so you don't have to keep going back and buying like the products you get at some big box stores. As you can see, I'm quite passionate about this issue! Great post - thanks! I would agree that the lower prices are available at big box stores. However, that feeds into our consumerist society. If you're buying way more stuff than you need at a big box, then you an afford to buy what you need to support your local folks. I think we as consumers need to realize what we actually need as opposed to how much junk we can get for a low price. For that reason, we shop locally. We go to our local hardware store, where the owner knows our names and is there everyday. If we have a question, I can ask someone where Earl is and he'll come out to answer the question. Last time I was there, I bought some canning jars. He spotted me with it and asked what I could be canning this time of year. We got into a whole conversation about local food, etc. Of course I can get canning jars at a big box (actually... they're probably stored away this time of year so I can't get them), but I can't have a conversation with a member of my community who just happens to own the store if I get them at a big box. There are many other examples... but that was the one I could think of right now. The sad news is that our local grocery store went out of business last month, less than a year after a big box moved in down the street. The big box actually has HIGHER prices, but the little store still couldn't compete. Great post! I have to get my hands on a copy of this book! Just checked out Deep Economy the other day from our library, and will check if they have this one. I am very fortunate to live in a rural community that is VERY local-loyal. Every one of our dollars tells the world what is important to us, and where our value is. I try to buy local whenever possible, or to buy from family-owned online sites. (Like mine ;) hint, hint) But seriously, if we do this more, the world will change. Strawberry Girl: I'm so glad! If you read this book, I doubt you'll ever walk into a chain store again without thinking twice. Please leave a comment at The Blogging Bookworm if you do review it so that we can link to it on that site. Needle: Yay! Let me know what you think. EcoLabel: The book dedicates a chapter or so to big box stores bullying smaller manufacturers. The problem is big but what I didn't realize is all the other problems we can lay squarely at the feet of a few big corporations. Abbie: What a great story. It is so much more gratifying to shop local. I do hope you read the book or at least flip through it. I was astounded by many of the issues stemming from the big box'ing of America. In addition, there are action plans for preventing your town from becoming Big Box Central and keeping some of the smaller businesses alive. Oh, and one more thing, I'm not surprised that the prices are actually higher at the big box store than the little grocer that went out of business. In the book, Mitchell details how often prices aren't actually lower or they aren't permanently lower. When a big box store moves into an area, it may start out with lower prices (often selling certain items that attract attention below cost but selling other items at a profit) and then, as competitors fall by the way side, gradually inching prices up. A very very important read. Mama: That's great that your town is still very local. You'll definitely want to check out the section toward the book, though, on how to keep things local. And, I agree re independent online sites. Smaller is better. Spreads the wealth, keeps things diverse, encourages new products. Wonderful review. On the beating up on the manufacturer's topic, my husband used to work for a small manufacturer who got a contract to sell through a big box store. The big box made the supplier pay for all signage (over $20K). When they placed their order, the supplier told the big box what would sell, but the big box wanted other stuff. When the other stuff didn't sell, the big box made the supplier buy it all back and cancelled the contract. The supplier was so depleted because of the expense of the signage plus the surplus merchandise that, in time, they went out of business. Well, a book with a 10 out of 5 rating has *got* to be a great read! :-) I just checked my library system -- they not only have three copies, but one is in my go-to branch. Guess what my "light bus reading" will be for this week?! Great review. I'll check it out. Sadly, I once claimed that a weekend wasn't complete without a trip to Target. It used to be a once per week kind of thing for me. Sometimes more. I still go from time to time now, but my *need* for Target has diminished with my changed habits. I did notice recently, however, they are now selling far more "green" products, like Dr. Bronner's. Could this just be that I live in Oregon? Or have they gotten the news that some consumers want other options? Either way, I have huge mixed feelings about this. I like that more people will be exposed to greener options, lending an air of mainstreamness. But I fear that Target is butting in on other Indie businesses, yet again. Donna: What a story! I'm afraid its way too common and part of the story behind our economic collapse. Knittingwoman: MEC definitely sounds like one of the better chain stores. Truffula: I'm so glad you are going to read it. Please post a review when you are finished! Natalie: Ah, I was just the same. I would often take the kids to Target just to kill time. I've noticed more green stuff in more mainstream locations and I think it's just a matter of following consumer interest. I too am conflicted by it. On one hand, it's great that Target and WalMart are stocking greener products or following greener practices. That doesn't alleviate all the environmental destruction they and other big box stores have wrought or cancel out any of the other abuses. Well that is strange, Jean! The most of the time, I receive better customer service from independently owned stores. Don't know what is up with your folks. Maybe they're a front for the mafia. Ha! That's just what we say whenever a business doesn't want our business. Good luck. Hope you get a lovely, independently owned, happy happy business in town soon. I have the same problem as Jean. With the exception of 1 grocery store, we don't have any big chain stores in our area. The employees are so rude that we now drive 50 miles to go to a Lowes rather than shop at the local hardware store! Not only do they have what I need in stock and have lower prices but the employees go out of their way to help and be friendly. I am so excited to have found this review. I had not heard of this book yet- I suppose being lost in a bubble of small children can do that to you ;) I requested it from my local library and look forward to reading it. Thanks! Allrighty I'm on it - I'll pick it up! Wow, I'm totally going to read this book now. I hadn't even heard of it, but it sounds right up my alley! I've been thinking about starting a "No Big Box" campaign for myself and my readers, to see how long I can go without shopping at a chain store. This would be a great precursor/inspiration for that!